ConceptDraw DIAGRAM is a powerful intelligent vector graphics engine for drawing graphics like flowcharts of equation solving process, histograms, line graphs, scatter plots, etc. Basic Diagramming solution includes 100+ examples that you can modify and make your own graphics. Sample 1. 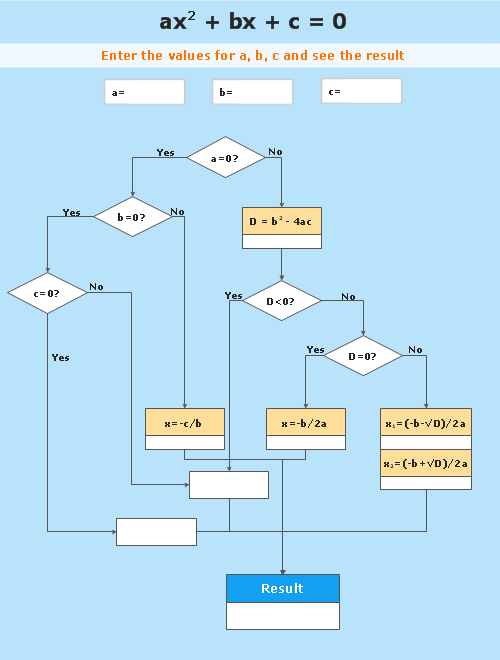 Flowchart - Mathematics - Solving quadratic equation. Use ConceptDraw DIAGRAM enhanced with Basic Diagramming solution to draw you own diagrams, charts and graphs for graphic communication, explanation of business and personal ideas and concepts, simple visual presentation of numerical data, complex structures, logical relations, step-by-step flows of actions, operations or math algorithm. ConceptDraw DIAGRAM v12 is a powerful intelligent vector graphics engine that can be used to create basic diagrams including flowcharts, charts, workflows, flowcharts, organizational charts, business diagram, learn business diagrams, flow diagrams. The popularity of Block Diagrams grows day by day. The existence of powerful software for their design is an excellent news! ConceptDraw DIAGRAM v12 Block Diagram Software offers the Block Diagrams Solution from the "What is a Diagram" Area.